Teachers’ Comments: A nicely curated subscription box. 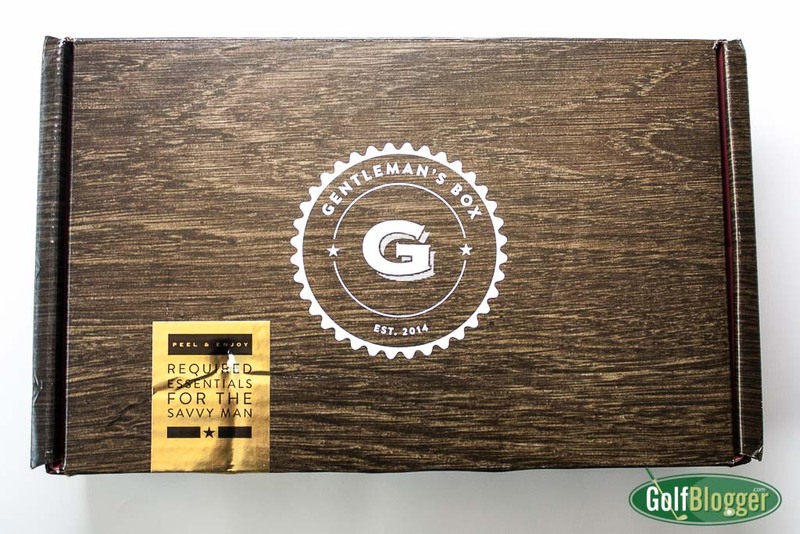 Each month, Gentleman’s Box sends to its subscribers a shoebox-sized container packed with items selected by the curators to fit both with the general notion of “essential elements suited for today’s gentlemen” and the company’s monthly theme. The cost is a relatively reasonable $25 a month. 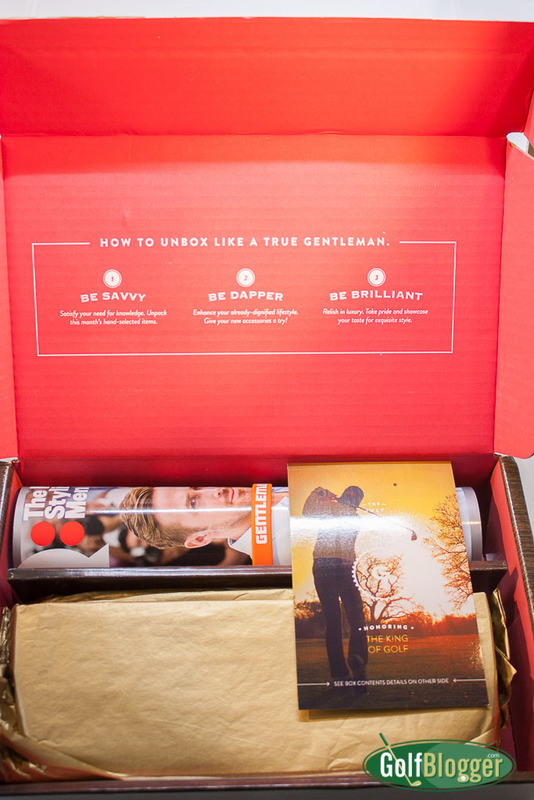 July’s Gentleman’s Box was golf-themed, honoring the King of Golf himself, Arnold Palmer. Inside was a Give Studio Flask, a pair of argyle socks from Richer Poorer, a set of golf ball cuff links from Tie.Com, a small bottle of Billy Jealousy face moisturizer, and a packet of Arnold Palmer Half & Half lemonade. Each box also comes with the latest issue of Gentleman’s Quarterly. The sum of such a subscription service has to be greater than its individual parts, and in the case of Gentleman’s Box, the math works out. The flask alone is $28. The socks, which I like, are $12. I don’t know what the moisturizer sampler would retail for; the Billy Jealousy website sells a much larger bottle for $65. The drink tube is just a few cents. A copy of GQ probably retails for a couple of bucks. If I had purchased this, I would be satisfied with the offerings. 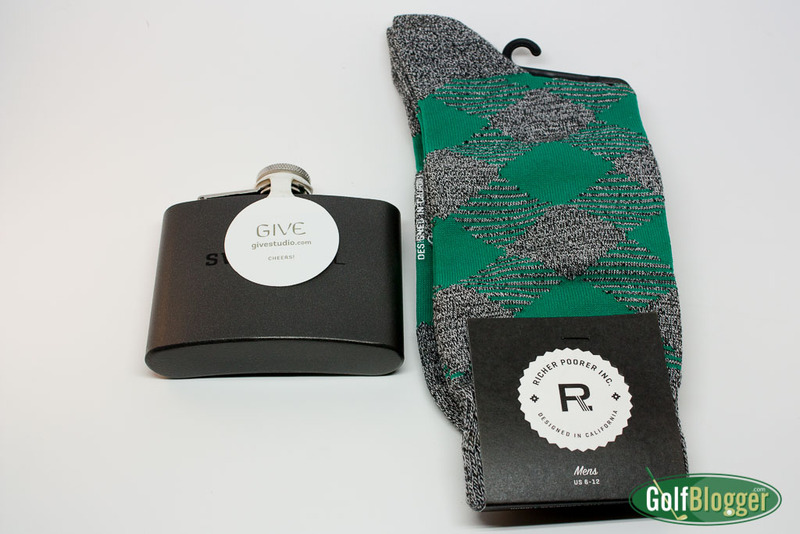 At worse, I would wear the socks, gift the flask (I have too many already) and cuffs, and try out the moisturizer. GQ would go up to the cottage for summer reading. I’m not giving Gentleman’s Box top honors because for me, the selection is a little too highbrow for my tastes. I don’t wear cufflinks, and don’t use face moisturizers (although I suppose you could argue that I should.) Looking at the May selection, I don’t know what use I would have for collar stays, or beard balm. I have a leather wallet that I’ve used for many years and expect to for many to come. Still, if you are of that sort, I encourage you to take a look at their past offerings to see how it fits your lifestyle. I expect that a great many will find this sort of thing exciting. There’s also the immaterial pleasures of receiving a surprise box in the mail each month. I think that it would be very cool to get a box every four or five weeks and unpack it to find out what’s inside. 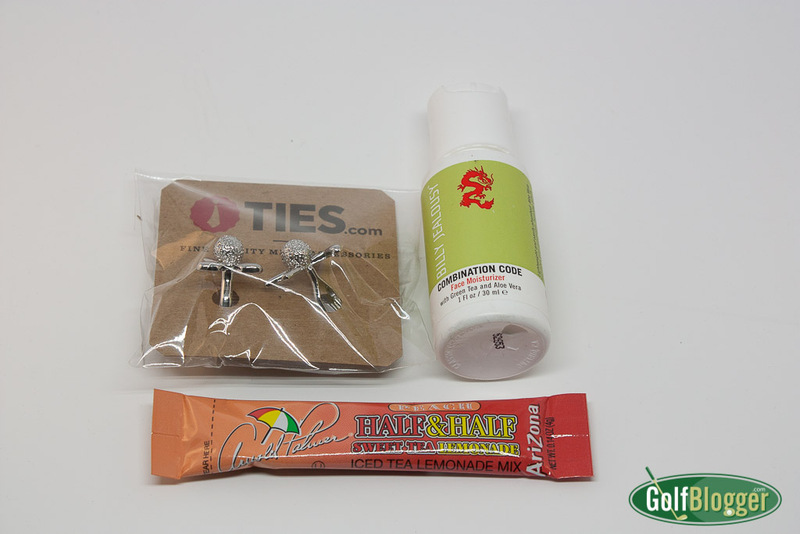 A personal bonus for Gentleman’s Box is that it’s a Michigan product, headquartered in Detroit. The GolfBlogger loves things made in Michigan.